A more detailed look at the city was not especially encouraging. There seemed to be a lot more detachments of undead scattered about, each with a death knight in command. At least it wasn’t the Horsemen of the Apocalypse AND a swarm of minions. It was still going to be a bother: Marty and A’ikana were best at small-group stuff, not at fighting swarms and Jamie hadn’t had a lot of practice with the undead. 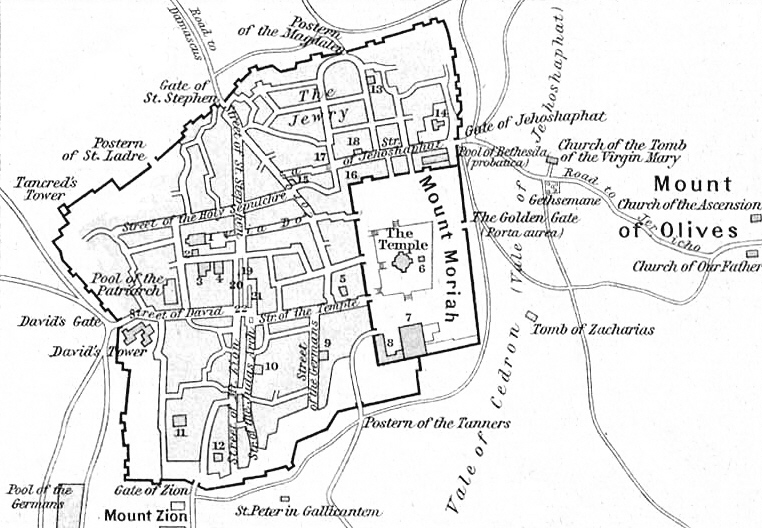 Jerusalem looked pretty overcrowded – at least as best they could tell from almost two miles out – although it didn’t look like disease or famine were running rampant. The undead besiegers seemed to be concentrating their efforts on the sections of the wall that had collapsed and been rebuilt haphazardly; the intact sections of wall and the gate were apparently too formidable for them to actively attack. In fact, the intact sections seemed to be faced with nothing but a thin screen of lesser undead and a bit of harassing fire. It was like they didn’t even care if the locals tried to break out. Ah; why should they? They had time, didn’t sleep, didn’t have much of a supply dump to raid, and could hold the siege forever. They had little fear of sallies – and in a dying world, overrun by undead and the forces of plague and famine, where would any escapees go? That would also neatly explain why they didn’t have any apparent outriders or scouts out. Even if there were some stray people left outside the defenses, what did they care? Still, it should be easy enough to break through to reach the city – even if that would only be joining everyone else in the trap – unless they tried falling back into the Catacomb realm, and that would definitely be tipping their hand. Jamie preferred a guerilla operation, staying outside, remaining free to move and hide, and making quick strikes against leaders and rear-echelon targets, and falling back. On the other hand, she had to admit that she had no idea how well that would work on an army of undead, they might be worse than robots – and she was used to weaponry that made walls and such pretty meaningless. Marty was for heading in and simply relying on a fast strike; move in quickly, break through one of the spots where the line was thin, get inside, and then see how the situation developed. The locals were evidently holding out pretty well, so they could combine efforts with them – and he didn’t feel like having to travel all the way back if he got killed. Besides, all those anti-undead talismans he’d invested in back at the Straits might help. A’ikana felt that it would be best to make a fast strike, get an idea what they were dealing with, and consult with the local religious authorities inside the wall. Unfortunately, there were simply too many kinds of undead to make any reasonable guesses at what this particular bunch might be especially vulnerable too. Kevin wanted information – it was what they’d come for – and only the locals would have it. A quick strike should get them inside – and they could always escape to the air via shapeshifting and telekinesis if they had too. If the undead could fly, they wouldn’t be besieging the place unless the walls were magic or something – and, if they were, the group should be able to fall back past the walls if necessary. Kevin threw some anti-negative energy and protection-from-evil spells all around and they got ready to head in. Wait! This place felt a lot like Baelaria in some ways. Maybe he could pull the same living-energy construct-armor trick? It’d be awfully conspicuous, but it certainly felt like he could… It would be best to save that until they were about to hit the undead though; it probably wouldn’t last for long. Marty thought that that would be great (it had certainly been fun last time) – and they’d probably need it. Too bad they didn’t have any horses or banners, but they’d never be able to get horses over the walls anyway. They got A’ikana to perform a blessing for them, even if it took her a few minutes to wrap her mind around the idea that the unseelie-demon-slaver, his casually-violent-amoral-businessman-friend, and the walking-war-machine were asking her for one. Kevin thought it was simple enough; they were on a mission of mercy, opposing an invasion by an unauthorized apocalypse, and religion was a BIG thing in the Crusader Kingdoms! The local religious powers were VERY strong! Nobody sane would embark on ANYTHING without a blessing in a realm like this! A group that went forth without the blessing of god from a duly-designated clerical type in the Crusader Kingdoms would be in big trouble; ill fortune and evil forces would follow them everywhere! It was over-exciting even to talk about such foolishness! Besides, the classical theology was that the worth of the blessings performer – and, in many ways, the recipient – didn’t matter, blessings were granted by the benevolent grace of god and often depended on the worth of the cause as long as the person performing them was a designated cleric. It wasn’t a very inspired blessing – A’ikana was still a bit nonplused at the idea – but it ought to be good enough for a quick strike, and the local powers that would listen to any of the rest of them probably wouldn’t be very helpful anyway. They headed for David’s gate. It was closest, and there was only one detachment of undead keeping an eye on it. Hopefully they could cut through that and make it to the city before any of the other groups could reach the area. The undead didn’t notice until they were pretty close. Kevin threw up the construct armor for Marty and A’ikana during the final moments of closing – he could only handle two, and Jamie hadn’t wanted any in case it interfered with her built-in equipment – and found that it wasn’t nearly as conspicuous as he’d thought it would be. Just a glitter of light and a hint of being in the sun even when shadows passed over them. Was that because it was interacting with the negative-energy-protection and protection-from-evil spells or because of the blessing or was it the “mighty-men-of-valor” routine? Oh never mind; they were closing, A’ikana had her personal enhancements up (quite a lot of them, no wonder the Church had felt free to send her into a combat zone), Jamie had all her systems ready to go, and Marty was always ready for a fight. Time to… uhh… re-kill some undead. Their mad rush took them into the midst of the group of undead – something like a hundred lesser creatures and three Death Knights. They should have taken the time to come up with a battle cry first. Various cries of “Hi there! Negative Reinforcements!” and “Your army stinks!” just lacked something. “Saintiago!” was at least period and religious (if geographically awkward). “Desperta Ferro!” (“Awake the Iron”? What had some of the kids been reading?) was a definite oddity. Simple wolf-howls were pretty inevitable – half their forces were werewolves after all – and they were from a version of France, so “Montjoie, St Denis!” fit in well enough, but Kevin vetoed “Spaaaaarta!” and “Elendillll!”; no point in giving away the fact that they were outsiders. Jamie just went in for a rebel yell, which fit in well enough anywhere, while A’ikana didn’t see the point. Why waste your breath? It wasn’t like anyone was going to intimidate the undead, and – while it pained her to admit it – Kevin’s Thralls didn’t have much in the way of morale or communications problems. As they hit the first few outlying undead, the three Death Knights turned, saw their approach, and pointed in their direction. Almost all at once the undead minions around the three death knights and around the camp turned and rushed towards the group. It looked like the Death Knights controlled them by sheer force of will or something. They’d just have to see how strong they were. The lesser undead swarmed Jamie, Kevin, A’ikana, and Marty – they were in the lead after all – and Kevin decided to try a new trick: he’d forged a minor relic designed to tap into the holy light of the Silmarils safely (and without giving their presence away) – so he tried “turning the undead”. It actually worked pretty well, although it also drew the attention of the Death Knights (and, as he’d intended, kept them focused on him instead of watching out for the others). Besides, it might confuse A’ikana, who thought he was a font of unholiness. He was of course, but he just had to hide that from the holy radiance! That blasted a number of the minor creatures, while Marty, Jamie, and A’ikana started cleaving their way through the minor ones with fair ease. In fact, they kept shattering the minor ones with only a few shots – Aikana smashing everything that came near her, Marty cleaving them, and Jamie ripping them apart. They hadn’t even had to reveal their movement advantages yet. Kevin had the Thralls pretend to be relatively helpless for the moment and prepare to blast the death knights if they moved in closely – especially if they stayed together. Witchcraft and indirect stuff to bypass special defenses if possible. For the moment, they weren’t advancing, since they were bracing to meet the wall of undead. They couldn’t stay on the defensive for more than a few seconds – they needed to keep moving towards the wall – but they could let the first wave of undead do the closing. A’ikana and Marty opted to try and flank them, so as to keep them together. The minor undead seemed to be unable to penetrate the construct-armor, so they could leave them to Kevin and his magic for the moment. As the Death Knights closed, Marty ran towards them, and – just as he was about to collide with them – made a sudden twirling leap, landing smoothly on one foot behind them. The Death Knights watched with amusement. A’ikana moved in to the side and launched a flurry of strikes, to help Marty flank them: she had a job to do – and these arrogant things should have been dead long ago. Unfortunately, despite some pretty powerful strikes, they turned out to be a great deal more durable than their lesser minions. Ah, the joy of carrying some major holy artifacts around with you. Besides, it helped mask his evilness (A’ikana read that thought easily enough and rolled her eyes at Kevin; oh yes, that was what it was doing. It looked like the only person the boy was willing to directly lie to was himself. She had to admit he worked on it though; it couldn’t be easy to find evil reasons to keep being nice all the time). Even with two holy artifacts and a focus spell he probably couldn’t turn a Death Knight – but who knew? Maybe the effort would stir up something local, it might raise morale in the city and make it easier for them to get information from the locals, and it would certainly help reduce the swarm. The resulting power-blast lit up the entire battlefield like a rising sun, and did indeed reduce the swarm very nicely, blasting numerous creatures to ash – but the lesser undead soaked it up before they even got to see if it would have any effect on the Death Knights. It did stop the advance for the moment, but the Death Knights were really annoyed now. Hopefully the others would be able to deal with them. One of the Death Knights snapped it’s fingers and spread a sheet of ice over the ground. Marty leapt up in time to avoid being trapped – but Jamie and A’ikana got at least momentarily stuck. A’ikana looks down, snorted, and looked back up as the second Death Knight took a swing at her with a glowing, rune-covered, two handed sword. It was bloody good. It hit despite the deflection-effect of the construct armor, but the armor soaked up all the damage anyway. Kevin was beginning to worry; it looked like – even discounting the rest of the horde – they were going to be in trouble if they couldn’t win before the enhancements wore off. How in the world were the locals holding them off? Massive amounts of holy power perhaps? Would it have any effect on him and the Thralls? Of course, considering that Marty currently looked like an out-of-shape merchant in medieval robes, that wasn’t hard. With forty-one Thralls ready to respond – 22 werewolf-thralls, 16 crew thralls, and Kevin’s usual trio – they could come up with a lot of witchcraft-based destruction. They couldn’t generate all that many shots before they’d be down to low-level spells that probably wouldn’t bite on Death Knights – but those first few blasts should take down almost anything. They’d have to get inside fairly quickly though; at this rate they were going to run out of resources all too soon. Weirdly, the Silmarils – even carefully tucked away in an inside pocket with some warding spells and such so as not to draw every evil and would-be owner around – suddenly grew very hot as all the Thralls focused their attacks. The patch of ground the three Death Knights were standing on suddenly exploded in a fury of light and crackling energy that left the two Death Knights Marty and A’ikana had been hitting kneeling and clutching at their swords. The third was still standing there holding his weapon while his armor smoked – but they all appeared to be badly injured. Evidently the Silmarils didn’t like Death Knights. Still, Kevin was impressed with both the Death Knights and the local defenders. They’d been holding off dozens of the things? What was keeping them from simply stomping over the walls? Marty, A’ikana, and Jamie promptly hammered them the rest of the way down. Disgusting goo and black blood sprayed everywhere as chunks of their bodies shattered and crumbled, while their armor was crushed like tin cans. One – leaning on his sword, trying to stand, and finding that he could not – had some final words before they finished it off. They’d probably be back shortly, but hopefully it would at least be a pain for them. If the group was really lucky they’d be like classical undead, and would be cast into the infernal depths or take years to return or something. They left behind a selection of glowing swords in blue, red, and green. Did that mean something? The other undead wouldn’t be arriving for a couple of minutes – they seemed to be limited to normal modes of movement – and they were pretty close to the wall. They let one of the Thralls with better-than-average divination magic take a quick look. The swords were definitely soul collectors of some sort and carried powerful enchantments on top of that. It was hard to get a good reading on them beyond that. Long term exposure was probably a bad idea, but handling them for short periods didn’t seem likely to cause harm. A’ikana wondered what would happen if she tried to bless an evil sword, but there was no time for that sort of thing at the moment. There were only minor undead between the group and the gate at the moment. There were more Death Knights around the city, but they were scattered along the walls and would take some time to reach them. More minor undead were closing in though. They headed for the gate. Fast. They blasted all minor undead within reach as they went though, just to thin them as much as possible. As the group approached they passed the wreckage of numerous burnt out siege engines from previous attempts to scale the walls. They also heard shouts from the wall and saw a rope ladder drop from the top. They climbed up hurriedly. They hadn’t had to reveal their mobility advantages, or too much about most of their powers, yet – and it would be best to keep it that way. Kevin had enough power-reserve for one more really big positive energy blast (not that he was announcing that – whether the enemy overestimated him or underestimated him, it would be to his advantage), so he covered the base of the ladder while the Thralls climbed up. The minor undead tried to swarm him – but the defenders on the wall filled the air with arrows, striking down undead with every strike. Some sort of holy blessing no doubt. Most of the party was already up the ladder when the first wave of undead broke through the hail of arrows. A’ikana helped people up and struck down minor annoyances, while Kevin waited until a horde had broken through – allowing time for the archers to take a good toll – before unleashing his blast and climbing up. Oh dear… Could the point of leverage be as simple as THAT? Was the boy actually fishing for APPROVAL from adults he respected or saw as authority-figures? Did his arrested aging actually go THAT deep? They had a small crowd. The one doing the talking was a knight wearing full plate, wearing a tabard with a large red cross on it. On the private channel, Kevin recommended using some sort of title. It would be important in this kind of setting. Sadly, Marty really couldn’t remember what merchant princes used. On the other hand, his Battling Business World title would be exotic enough. Oh blast, they should have gone with an alias or something. They weren’t exactly anonymous. On the other hand, undead spies would be fairly conspicuous. It probably wouldn’t spread too quickly anyway compared to rumors. A’ikana simply went with “Abbess Esther”. Nicely biblical. No one was hurt, which was apparently considered somewhat miraculous. A’ikana offered to do some healing if that was needed. It was. The various knights had mostly been keeping up, but the real problem came from the interior of the city. The healers were going to get overwhelmed soon without assistance. Disease, hunger, random injuries and weapons-fire… It was all taking a steady toll. Luckily the priests and Hospitaliers have been able to stay ahead of the problem, but the city was too overcrowded for the people we have. Throwing more divine power at such problems only sapped it from the defense. The locals would be glad to accept any assistance that could be provided – but advised them that, before they headed into the city, they had to understand the new law the Knight-Commander had enacted. Breaking the peace because of religious intolerance would result in criminal charges. They had enough problems as it was without breaking the fragile alliance of Christian, Jew and Muslim that had held the defense. He seemed mildly surprised that everyone seemed to like that law just fine. They would of course; they were all from much less religiously-oriented worlds. Marty was kind of sad that they hadn’t brought any trade goods with them; he’d have liked to help them out like a merchant should – only for free this time. Oh well, they wouldn’t have been able to get them over the walls anyway. Kevin told him not to worry. They could produce some, he thought that blowing up undead counted as assistance, they’d set up a gate later after they had the information they needed, and the locals wouldn’t have expected them to bring much up the ladder anyway. Besides, they were mostly there to get a good description of how the world ended, any clues as to the usual strategies of the Horsemen and their possible weaknesses, and then to help out. Yes, he sympathized with the locals – but the rest of the multiverse took priority. Personally, he wanted to find out if there were any clues as to how souls were brought to these worlds, how they could be bound, where they were taken to afterwards, and who was behind it all! The swords would be one set of clues already. As for the city – it looked like everyone there had a soul, and that the current population was close to a million. That was pretty impressive: the locals HAD to be using massive amounts of magic just to provide food and water for that many. Unfortunately, the besieging forces looked to number about 100,000 minor undead, and 300 Death Knights. That was awkward. The local knights were focusing holy power to keep them all out, bolstering each other using auras, and sitting on top of the most holy site in the realm. They were relatively weak one-to-one, but their abilities seemed to scale well in groups. They’d been using siege weapons, focused attacks on Death Knights, arrow fire, and feinting holes in the defenses. They didn’t have the manpower to break the enemy, and the enemy couldn’t focus enough power on the breaches that did occur – so it had devolved into a siege. All dead had to be burned though; it seemed that the mere presence of the Death Knights was enough to stir the dead into undeath. So far, what worked best was fire; the undead burned quite well. Sadly, they didn’t have the supplies they’d need to manufacture greek fire. Kevin decided to harass Jamie a little. She’d been too quiet, and needed stirring up a bit. “Tactics does play a crucial role in combat, but numbers also play a rather important factor in dictating the tactical advantage that one must overcome – and they have the numbers. “About the only way we could win the way I see it is to force them to continue running down a narrow area so their numbers are a hindrance and I can just carve them up until I pass out or they fall back totally. Set up a phony entry point and then have one or two people there to greet them. Either they continue trying the entry point or they pull back and try to find another way”. Well, that would just be a larger-scale variant on the “feigned hole in the defenses” bit, but the nice thing about that was that besiegers couldn’t ignore possible holes in the defenses or they’d never get anywhere. A’ikana though that infusing the area with even more holy energy might help, but that 100,000 undead was a pretty large stumbling block. This would take thought. Perhaps fire elementals or something? Marty was kind of wishing he was a procurement man. They could reach into their pockets and produce many useful things! Maybe they could spread normal fires around? The death knights are powerful, but taking out the rank and file troops would take stress off the defenders – and it would be good if they could take out whoever was commanding the undead forces. Then they could do a surgical strike. Kevin thought that – before they scared the locals to the point where they wouldn’t talk to them – they’d better try to collect information. Several of the Thralls could produce food and basic cloth and such, so he set them to doing that. One or two had healing spells that were – if basic – limited by applications-per-individual-per-day, not by the number of patients, which should also help with the situation in the city. Besides, working the streets, they’d hear a lot. A siege was fairly stable if the defenders could be kept healthy and fed. According to the locals, the Death Knights seemed to be in command, but their main camp was well out of reach of attack – and the number of Death Knights there (estimated to be about 20) made an assault prohibitive. Kevin had to agree. That many Death Knights would be near-impossible to handle. On further questioning, the locals knew of a few other weaknesses for the Death Knights. They were vulnerable to holy energy and to damaging or breaking the runeblades they wielded. No one knew if they were sustained by the imprisoned souls within the blades, or whether the blades actually carried the soul of the Death Knight itself in addition to the souls of those they defeated. They did know that Death Knights whose swords were broken did not return, whereas even decapitated Death Knights returned in weeks or months. Perhaps destroying the swords was a true death for the Death Knights? It was a good thing that they’d picked up the blades from the ones they’d fought. It was definitely something to work with – although it also meant that Kevin had better get to work on them and make sure that they didn’t constitute a hole in the cities defenses. It took about an hour per blade to be sure. They were nasty, but he could layer them in all the spells he liked. Marty suggested taking the Silmarils to the Temple Mount, since it was the main focus for the mystical defense. They had seemed to react, but Kevin wasn’t sure that he wanted to reveal that he was carrying them. It was certainly worth a visit though, unless the place wouldn’t let him near (which was certainly possible). Apparently the religious neutrality of the Temple Mount had been one of the main concessions during the defense between the three major religions. A’ikana was considering an air strike on the commanders. Ride of the Flying Nun with Fireball! It would be a pretty good distraction even if the Death Knights were too tough for one shot – which seemed likely, even if they REALLY stacked it up. Perhaps some illusions to make it look like a major force was coming in from the flank? Still, a diversion was no use unless they found a good target to hit while the undead were being diverted. With an army of a hundred thousand against them, Kevin began to feel that – perhaps – his best strategy was simply to recruit. Marty went to chat people up in the inns. Under these conditions, people needed to drink more than ever – and the gossip would flow freely. It would also be a prime place to spot any signs of infiltration. Years of raid defense had taught him that that was ALWAYS a problem in sieges. It quickly became obvious that the weakest link in the defense was the religious fault lines. Those inciting violence or insisting on difficult-to-accommodate positions were working to undermine the alliance – whether in the service of the Horsemen or simply because of their own blindness. Knight-Lord Amadeus had been demanding the dismissal of the Muslims and Jews from the Round Table Conference. He apparently disliked the inclusion of the Jewish and Muslim equivalents of knights in the Conference and insisted that it was the Christian mission to defend the city and it’s lesser peoples. He was suspected of inciting religious violence. Knight Master Lichstein of the Hospitaliers had been at the center of a large number of strange deaths among the poor people of the city. Investigations kept getting stalled by the practice of burning the bodies shortly after death. Merchant Prince Hauser, a Jew, had been accused of hoarding supplies and materials from the defenders and locking them up in storage vaults. Investigations kept getting stuck on analyzing the company records. Arch-Mage Antonidos, high priest of the Zoroastrian religion, had been advocating the inclusion of the Zorastrians and Mithrans into the Round Table Conference. His claims were being met with disdain, as the big three religions considered the Zoroastrians pagans. A’ikana found that interesting; the Zorastrians were still around in the holy land. She was fairly sure that that was a bit out of place from real-world history.